Mix flour and sugar in a bowl. Using hands, mix butter into flour until the mixture resembles coarse meal. Combine vanilla and almond extracts with water, then quickly stir mixture into flour. Gather dough into ball and flatten into a disc. Refrigerate for an hour. Remove dough from fridge and allow it to stand until malleable. Press dough evenly over bottom and sides of 9-in tart pan, extending dough about 1/8 in beyond the edge of the pan. Set aside a little of the dough. Prick shell lightly and refrigerate for another hour. Cover the shell with parchment paper, then weigh down with baking beans. Bake shell until shell begins to set and brown, about 10 minutes. Remove the beans, then bake for another 5 minutes. Set crust aside to cool. In a small bowl, whisk together the eggs and cornstarch. Gradually add 1/4 cup of half-and-half, whisking until the mixture is smooth and cornstarch is dissolved. In a medium heavy nonreactive saucepan, combine sugar, a pinch of salt, and remaining 1 3/4 cups of half-and half. Over medium heat, bring mixture to a full boil, stirring occasionally. Whisk 2 tbsp of hot mixture into egg mixture, then pass egg mixture through strainer into a small bowl. Bring half-and-half mixture back to a boil over medium heat, then quickly add all the egg mixture, whisking rapidly. Continue whisking rapidly for about 20-30 seconds, being sure to go into the bottom edge of the pan. The mixture should become very thick. Remove mixture from heat and whisk in butter and almond extract. Immediately pour the mixture into a bowl and cover with plastic wrap directly on the cream to prevent a skin from forming. Refrigerate until cold. To assemble: Pour the pastry cream into the cooled crust. 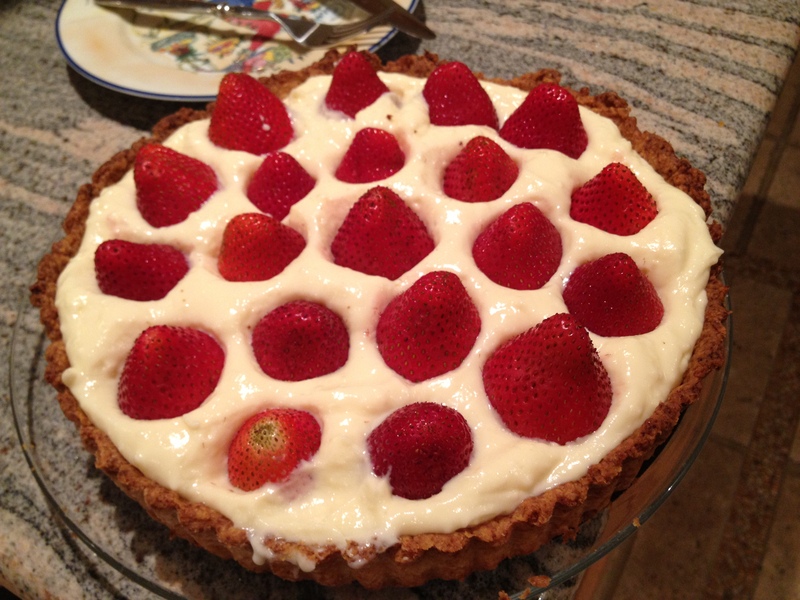 Place hulled strawberries on top. Serve immediately.